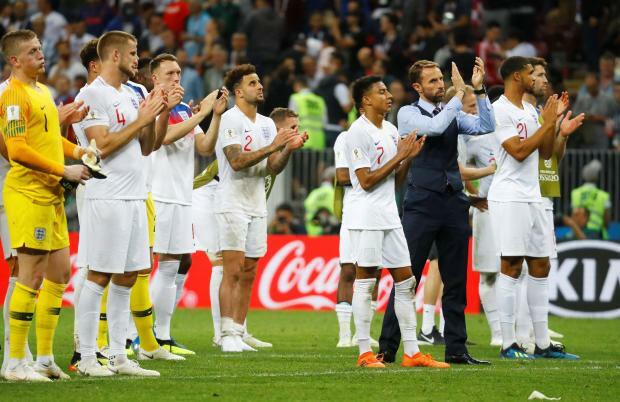 England players salute their fans at the end of Wednesday's semi-final. England players were quick to share their pain on social media after Wednesday night's heartbreaking World Cup semi-final defeat to Croatia. Kieran Trippier's early free-kick put the Three Lions in the driving seat in Moscow, but Ivan Perisic levelled midway through the second half and Mario Mandzukic's extra-time strike sent Croatia through to Sunday's final against France. Captain Harry Kane told his over 2million followers: "It hurts a lot. It will hurt for a while. We can be proud and we'll be back. Thanks for all your support." Midfielder Jesse Lingard said: "Was an honour to represent my country at the world cup. The squad we have is a great bunch of lads who are willing to learn and give everything and we can hold our heads high. Thank you to everyone who supported our journey - we dont stop here!" Striker Marcus Rashford posted: "Really tough right now but this team's special.. we'll be back. Hopefully this is the start"
Full-back Trent Alexander-Arnold said: "Absolutely devastated that our journey is over! We enjoyed every moment as a nation, I'd like to thank all the staff and fans for being behind us. It has been an honour to be a part of this special team. We will be back stronger"
Centre-back Harry Maguire said: "Devastated. Absolutely gutted. Thanks to the fans for your incredible support." Goalkeeper Jack Butland wrote: "Devastated to not be coming back here for the final on Sunday but this is just the beginning for this squad! To each and every @England fan, the support has been incredible and we can't thank you enough! #ThreeLions"
Forward Jamie Vardy posted: "Gutted..... Thank you to every one of you who have been there each step of the way! The support at each game has been incredible. Sorry we couldn't cross that final hurdle. Congrats to Croatia and good luck to you in the final #England"